A former Rwandan army chief of staff, Faustin Kayumba Nyamwasa, has been shot in South Africa and taken to hospital in a critical condition. His wife told the BBC the couple had been returning from shopping when a gunman opened fire on the car. She said it was an assassination attempt as there had been no demand for money or goods. 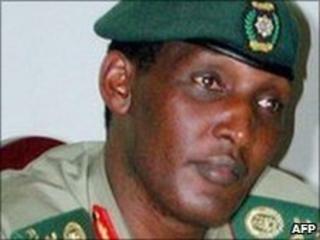 Lt Gen Nyamwasa, an outspoken critic of President Paul Kagame, fled from Kigali in February. He was shot in the stomach during the midday attack and is now undergoing surgery in a Johannesburg clinic. Mrs Nyamwasa said the gunman had shot at them until his gun jammed. Rwanda's government told the BBC it "does not condone violence" and "trusts the South African authorities' ability to investigate the incident thoroughly". "We learned the news through the media, we have no confirmation of the incident," Louise Mushikiwabo, minister of foreign affairs, said in a statement sent to the BBC. "We wish the family strength and serenity," she said. BBC Africa analyst Martin Plaut says Lt Gen Nyamwasa was one of President Kagame's closest confidants, until they fell out. Since arriving in South Africa, the former army chief has accused the president of corruption, accusations the Rwandan authorities have denied. He also claimed the judiciary were compromised and told the BBC in a recent interview that the judges were now "President Paul Kagame's property". A couple of months after he went into exile, along with another top military officer, President Kagame reshuffled the military leadership ahead of elections due in August. At the time, two high-ranking officers were also suspended and put under house arrest. The elections will be the second presidential polls held since the 1994 genocide in which 800,000 Tutsis and moderate Hutus were killed. Lt Gen Nyamwasa played an important role in the rebel Rwandan Patriotic Front (RPF), led by Mr Kagame, which put a stop to the killing and which is now in power. But France and Spain have issued arrest warrants against Mr Nyamwasa for his alleged role in the lead-up to and during the genocide, along with other senior RPF figures. He has also been blamed for a series of grenade attacks in Kigali in recent months, something he vehemently denies. Mr Kagame, in power for the last 16 years, is viewed by many in the West as one of Africa's more dynamic leaders. However critics have raised concerns about his more authoritarian tendencies and the government has recently been accused of harassing the opposition ahead of the elections.